Fuzz was feeling crafty this morning and suggested we make soap. We hadn’t done any soap making in a while, but since we had all the ingredients on hand- lye, hog fat, saffron, crushed beetles. Just kidding. Soap making is super easy and you can find the basic materials at the craft store. We bought our supplies at a store called Hobby Lobby, but I think Michael’s probably has the basics too – clear glycerin soap base cubes, opaque coconut oil soap cubes, scents, colors, molds and charms. Here’s Fuzz’s soap. She made it herself, so if an almost-6 year old could make this, think what you could do. It’s not a very messy activity, but you will want to buy a cheap vinyl table cloth to put over the table. Here are some pictures of the supplies you’ll need so you’ll recognize them in the store. Craft stores can be overwhelming. 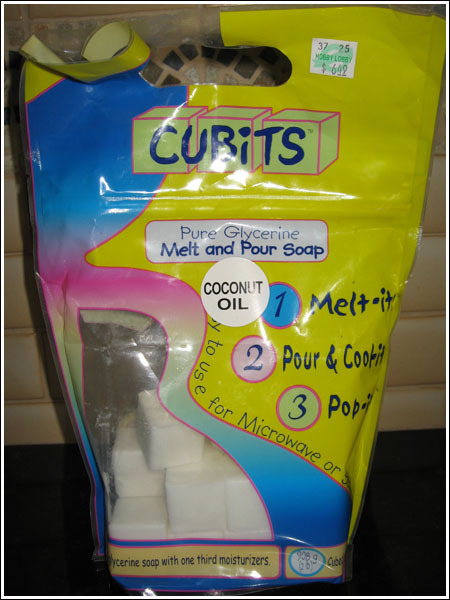 Glycerin cubes in clear and opaque which you melt in the microwave. They melt in about 30 seconds. These are the opaque cubes with added coconut oil. 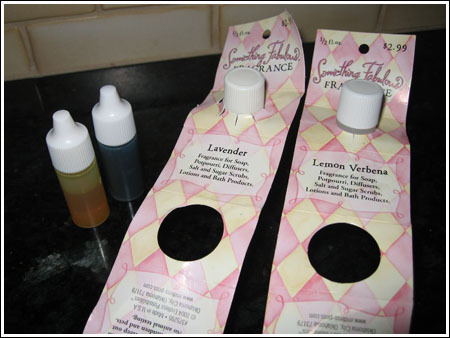 Scents and colors — Stores with soap supplies should have a nice variety to choose from. 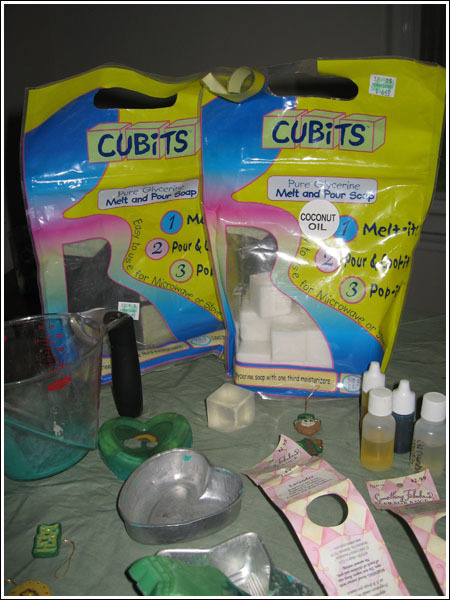 Molds — You can use soap molds or candy making molds. You could even shape your own out of foil. I forgot to take a picture of the mold, but it’s a little tin thing in the bottom picture. 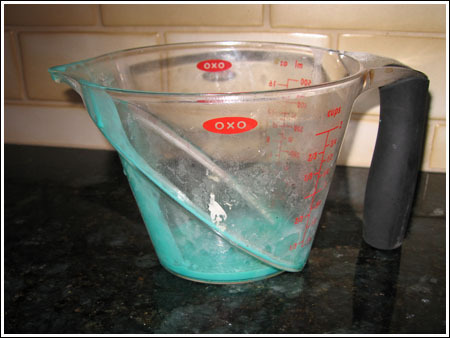 A sturdy liquid measuring cup you can microwave — Sorry this one’s messy. I took these pictures in a rush. 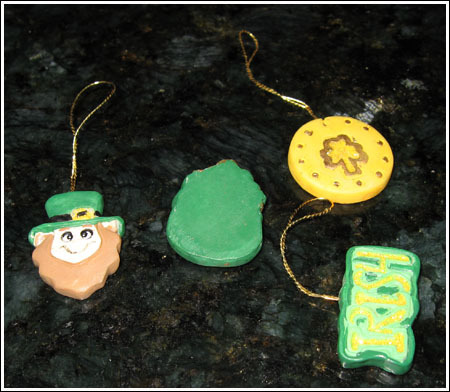 Charms — Use whatever trinkets you find around the house or buy trinkets. We had some old Irish trinkets. Boys would probably enjoy Matchbox cars. 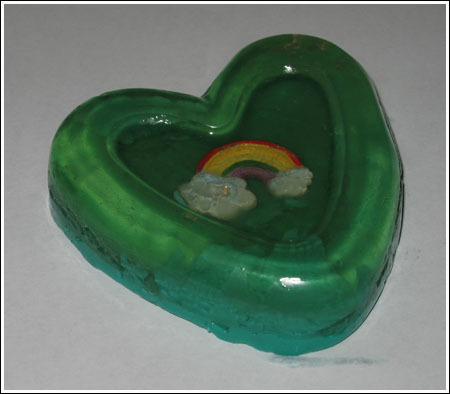 To get the charm to show through the window, you pour a thin layer of melted clear glycerine into the mold, let it set (freezer sets it in minutes), nestle a charm in it, pour more clear over the charm. Let it set again, then pour a back color over the charm, which at this point is encased in the melted clear glycerine. Let the soap sit for a few hours then pop it out and let it rest for a while before using. That’s the gist of it, but whatever craft store you frequent will have books on basic soap making, so you can pick one up while you are there. It’s almost as fun as baking.